Recently I’ve been working on my least favorite part of programming: user interface design. This is the simple dialog, and only allows one thing to be selected at a time. This other one is the advanced dialog, and allows the user to specify from all of the criteria at once. The selection mode can be either “match all” (all criteria have to match for the data to be selected), “match at least one” (the data has to match at least one of the criteria), or “match none” (none of the criteria can fit the data). The comboboxes in the middle specify the conditions that have to be met (equal to, not equal to, less than, etc), while the entries specify the data to be compared. 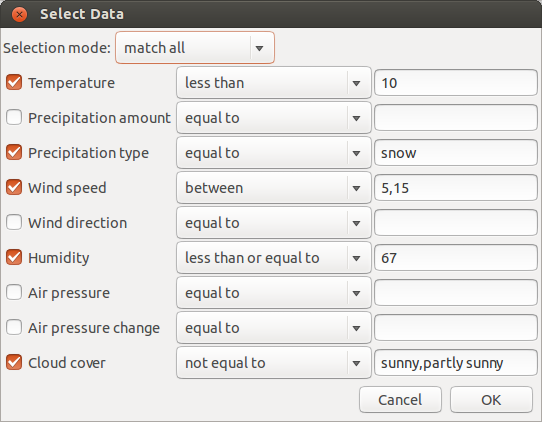 As shown in the screenshot, some conditions (between and outside) require multiple values, while others (equal to, not equal to) don’t require but can use them. The entries are not case sensitive. So in the previous screenshot, the criteria will match data in which the temperature is less than 10 degrees, the precipitation type is snow,the wind speed is between 5 and 15 kph, the humidity is less than or equal to 67% and the cloud cover is anything other than sunny or partly sunny. It’s not perfect, but it’s not bad for a start.